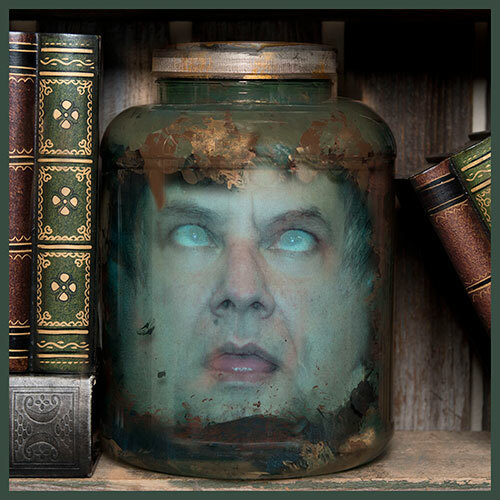 So you want to email in your pictures and have your own head in a jar? Or your ex’s? More than happy to make your grim wish come true. 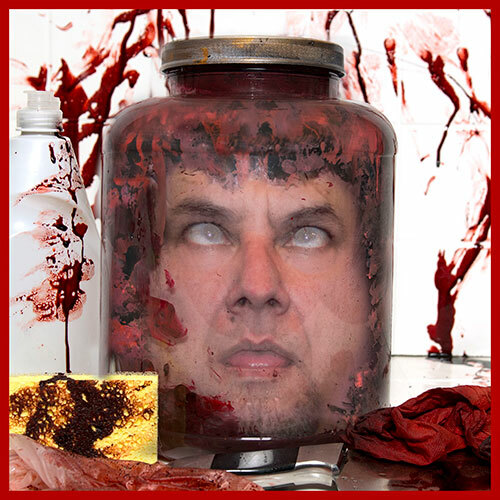 Here’s a bit of info: Each Little Jar of Horror contains a laminated, full wrap around hi resolution image cylinder that we create from your images. It is placed into a 8"x11" plastic jar that is hand painted in the motif of your choice, either Fetid Green or Fresh Red. Each jar comes with color tablets that you place in the jar when filling it up with water. As the water level rises, you will see that the design achieves the desired depth and distortion to give it the illusion of being 3-D. Sounds creepy as you wanted? Then let’s get started! Fetid Green or Fresh Red custom jars are just $37 each! 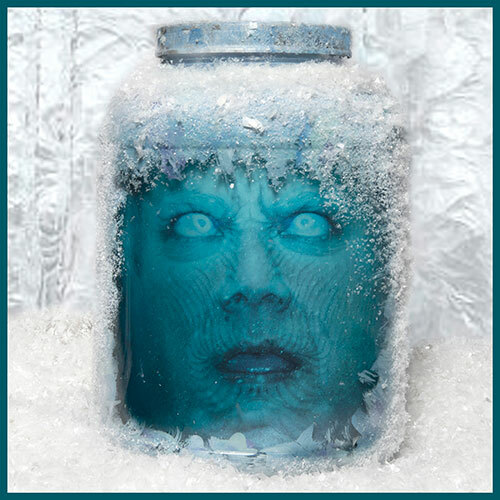 Frosted Blue jars are just $42 each! To get started please purchase a custom jar using the PayPal button below, choosing either the SHIPPING OR PICK UP option. Use the dropdown option to select whether you'd like the Fresh Red, Fetid Green or Frosted jar style. Once you have successfully purchased the jar through PayPal you will receive a confirmation email from PayPal. We will also receive a similar email.. Once we have what we need, we will get started on your jar and let you know when it is shipping. 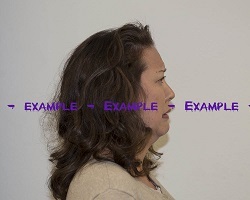 The important thing to remember when you get in front of the camera yourself or are pointing the camera at your friend or family member is that we need your head straight….nose pointing towards the lens. I know it is hard to do a creepy pose without moving other parts of your body in mock manifest of the monster you are trying to be, but you can’t. 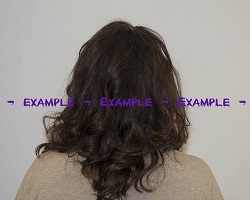 We have to have your head lined up straight and symmnetrical for the image to be able to be used. The best floaters have the mouth open halfway, tongue just slightly out or lolling out to the side….eyes wide, maybe glancing to the side, up or even crossed. Just basically look dead and uh, floating. You can also give the impression you went out with more character, and go with a scared expression, crazed look or evil grimace. 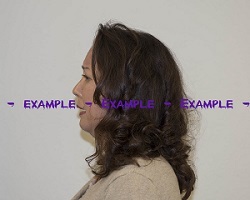 If the mouth is open for the front picture, then the same expression has to be matched when the side pictures are taken, so that the jaw lines up. This is all important for us in post production, as it helps us get the jawlines, cheekbones, and hairlines to line up when we are digitally stitching them together. Once we have everything pulled together, we will make your eyes opaque and milky. Practice makes perfect, right? 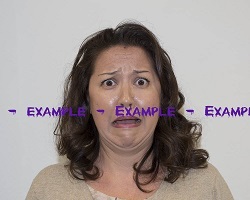 Go to a mirror and work on that weird expression…..its totally okay, we give you permission.